One of the most neglected systems on a building is the rooftop duct system. In many cases, it is “out of sight, out of mind” until leakage or other functional problems occur. Rooftop components are often put into place and never or rarely maintained again. This can lead to poor performance or even an entire system failure. A desirable rooftop duct system is one that is able to withstand harsh weather conditions, offer efficient air conveyance, and have long-lasting durability. Weatherguard® Duct Systems is that product. 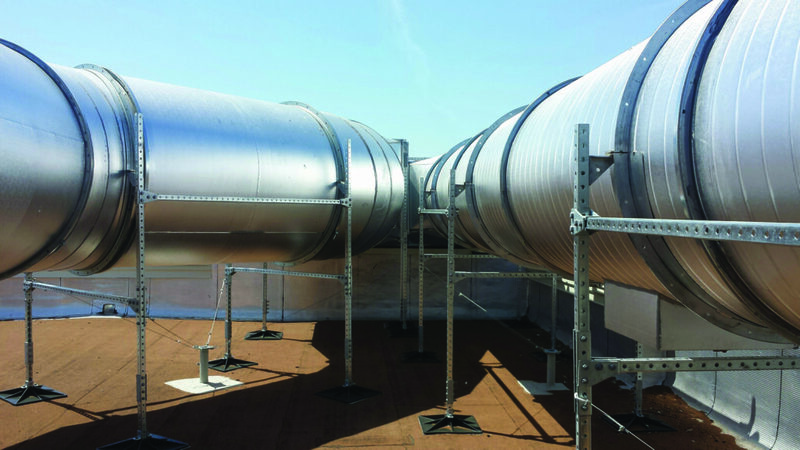 Weatherguard® Duct Systems by MKT Metal Manufacturing is a weatherized, factory manufactured HVAC duct system designed to withstand and maintain efficiency in unforgiving weather conditions. As depicted in this graphic illustration (Weatherguard Video), Weatherguard was designed and laboratory tested for maximum efficiency and reliability. Weatherguard® Duct Systems is comprised of exceptional products from our partners AK Steel, Spinfinity, 3M™, and MIRO Industries. climates and environments. Weatherguard® is suitable for new construction and also re-roofing of old, insufficient systems. Presentations on Weatherguard® and other great MKT products and services are available. If interested, please contact Ken Brown at 717-600-5182 or kbrown@mktduct.com. MKT Metal Manufacturing Partnership with MIRO® Industries Inc.